I knew I was officially a climber when I bought my first pair of approach shoes. 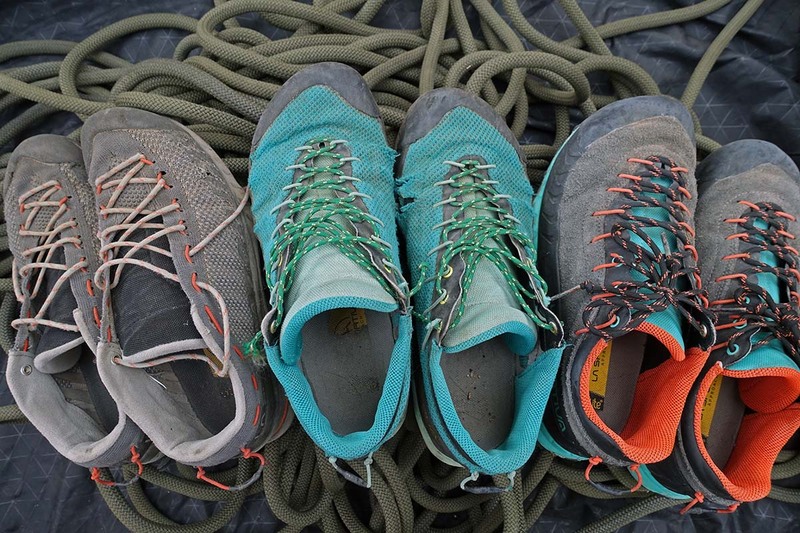 A climbing-specific style of footwear, approach shoes offer a unique combination of hiking shoes, climbing slippers, and sometimes even mountaineering boots. Because approaches can vary from a walk down a paved sidewalk, scrambling fourth or fifth class, or a multi-day, multi-terrained slog with a 60-pound load, approach shoes are a diverse bunch. Below we break down the top approach shoes of 2019, from ultralight crag shoes to mid-height waterproof models. To make sure you get a shoe that caters to your specific needs, see our comparison table and buying advice below the picks. What we like: Leather upper is more durable and comfortable than the mesh TX3 for only a small weight penalty. What we don’t: In hot summer conditions, breathability can be limited. 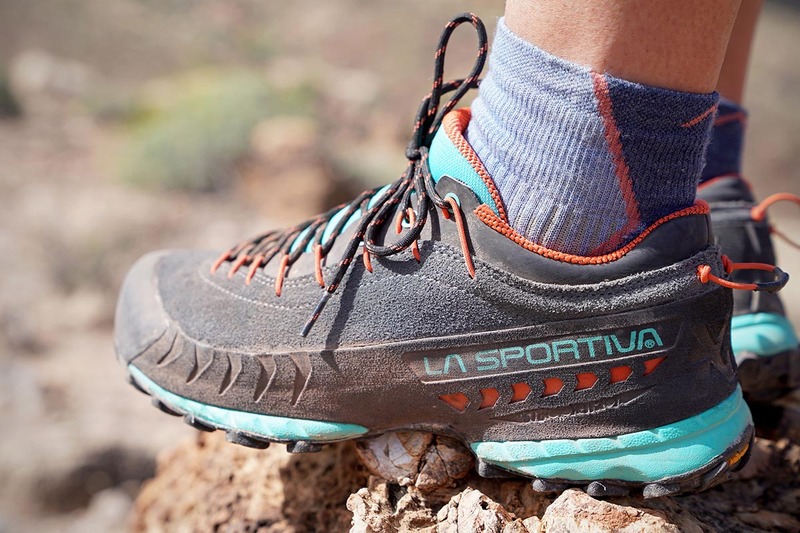 La Sportiva’s popular TX series combines features from climbing shoes, mountaineering boots, and mountain running shoes, ranging from the superlight TX2 to the durable TX5 GTX boot. Of this venerable grouping, we like the balanced TX4 best. It offers a standout combination of protection, low weight, durability, and comfort, and is suitable for everything from carrying on your harness to long hikes with heavy loads. The Vibram rubber is super high quality and among the stickiest we’ve tested for both climbing and hiking. Further, the shoe sports details such as a smooth area under the big toe for smearing and edging and an in-cut heel for downhill braking on technical trail. Weight: 1 lb. 10.4 oz. What we like: Climbs exceptionally well and highly durable. 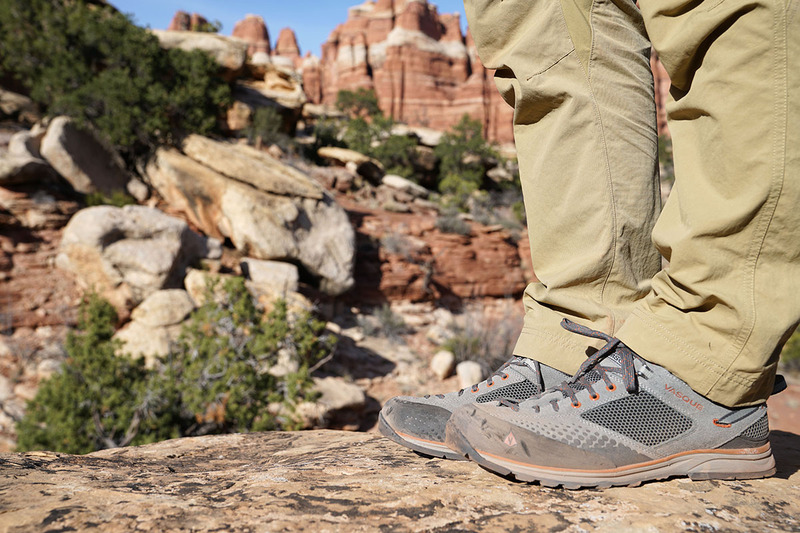 What we don’t: Stiff sole detracts from sensitivity, and not our favorite for hiking. Five Ten’s Guide Tennie is credited with pioneering the approach shoe category, and decades later it remains one of our favorite all-around designs. What sets the shoe apart is its performance on technical rock: the durable suede upper offers a close fit, and the beveled climbing toe and edging platform perch on small edges with nearly the precision of a climbing shoe. With sticky rubber both on the sole and the top of the toe box, it also climbs well in cracks. And the latest Guide Tennie is a few ounces lighter than the older version, though we still prefer the La Sportiva TX2 below for toting up routes on our harness. What we like: Great update of the old classic. Light and affordable. What we don’t: Not up to the task of long or technical hikes. Evolv’s Cruzer is ubiquitous among climbers, known for being one of the lightest and simplest approach shoes ever made. 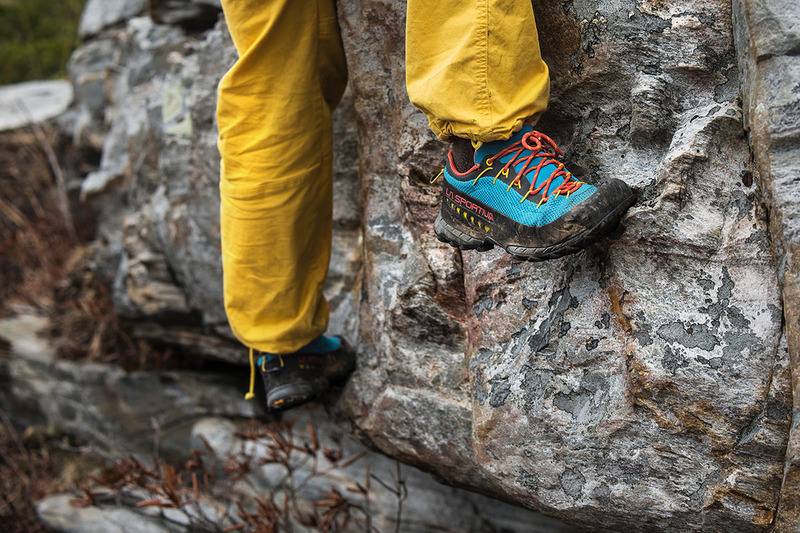 The original model has long been our shoe of choice for crag days, carrying up multi-pitch routes with slabby descents, and even mellow scrambles close to the car. Evolv recently updated this classic shoe, building it on a new trail running last, adding a liner and padding throughout the upper, and widening the rubber rand around the toe box. In sum, the Cruzer Psyche is a better (and surprisingly lighter) shoe than its predecessor. It’s supportive and durable enough to be considered trail-worthy (just avoid long, technical hikes or carrying a heavy pack) while maintaining the minimalist attributes that sold us on the Cruzer in the first place. The Cruzer isn’t the lone ultralight option—La Sportiva’s TX2 and Arc’teryx’s Arakys are competitors—but it has all the features we look for in a crag shoe. The heel folds down for a quick on-and-off slipper, and a microfiber lining provides comfort for bare feet. To top it off, the Cruzer Psyche is roughly half the cost of the TX2 or Arakys, making it our favorite budget approach shoe on the market in 2019. 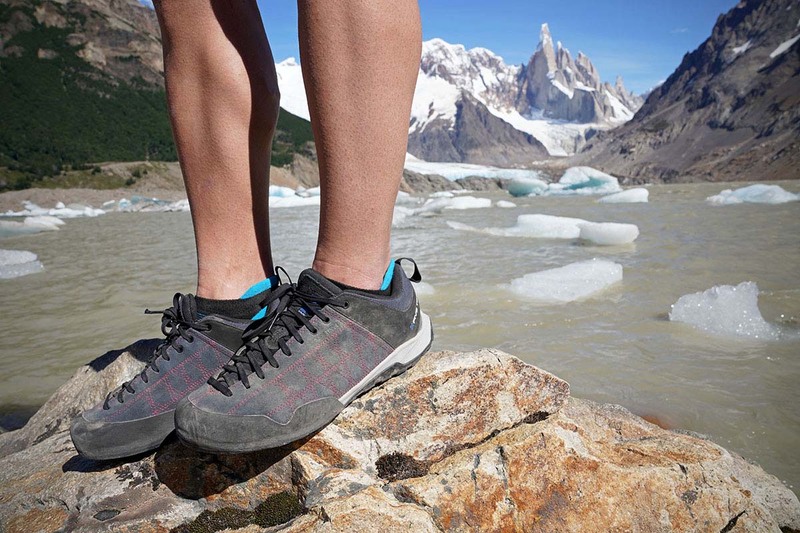 What we like: Powerful and durable shoe for mountain environments. What we don’t: This shoe is not one you’ll want on your feet on fifth-class terrain. 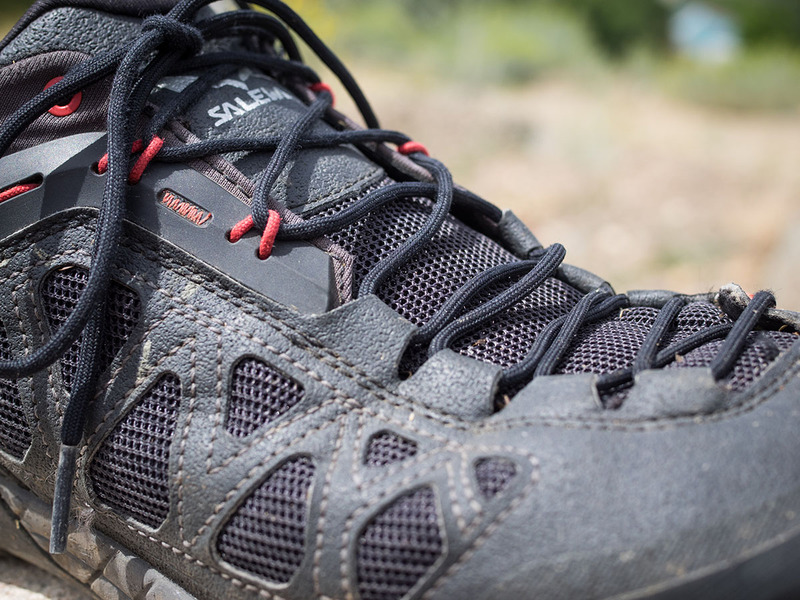 Let’s get the bad news out of the way first: Salewa’s Mountain Trainer GTX does not climb well. If you’re looking for a shoe to transition from the trail to fifth-class terrain, this heavy, bulky Gore-Tex shoe is not the one. But that’s about all it doesn’t do well. For their guided trips up the Grand Teton in Wyoming, Jackson Hole Mountain Guides’ shoe of choice is the Mountain Trainer GTX. This says a lot: these shoes are absolutely built for the mountains. With the breathable Gore-Tex liner, durable construction, and high level of protection, the Mountain Trainer GTX shoe is in its element on technical terrain such as loose scree, dirt, and kicking steps in snow. And for hikers interested in exploring more technical terrain with a lighter weight and more form fitting shoe, this is an excellent choice. The heel cup and comfort are exceptional, transforming your feet into mountain climbing machines. Weight: 1 lb. 3.6 oz. What we like: A great shoe for toting up walk-off routes. What we don’t: Minimal support, lacking in durability. The TX2 is not only the lightest member of the La Sportiva TX family—it’s one of the lightest models on our list. At 9.8 ounces per shoe, it’s a minimalist design but packs a surprising number of thoughtful features. It’s more breathable than the Cruzer Psyche above and closer to a trail-running shoe than most (we’ve seen mountain endurance enthusiasts put in mile after mile on the trail in the TX2s). 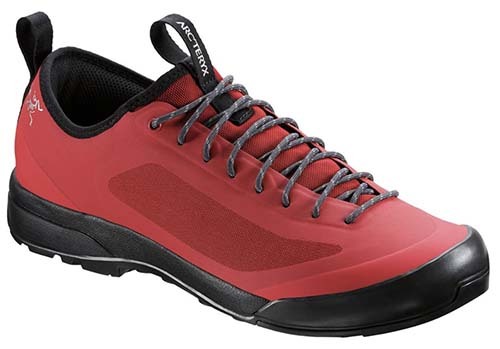 Further, when the hiking leads to long, moderate scrambles on rock, these shoes make the transition swimmingly, with added rigidity in the toe box and Vibram’s proven sticky rubber. The knock against the TX2 is that it isn’t particularly durable, especially when pushed to its limits. 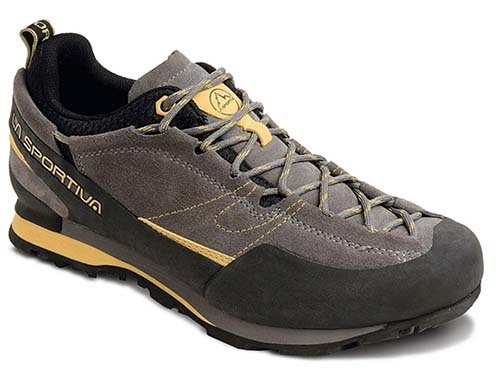 La Sportiva does make a leather version of this popular shoe—for a few more ounces you’ll get an increased lifespan and slightly better protection. That said, both the leather and mesh versions have a thin midsole and sole that lack support and longevity, falling far short of the TX3 and TX4. But for strong feet or those who love the minimalist design, the TX2 can go just about anywhere. And with an elastic loop for streamlined carry on your harness, these are some of the best shoes on this list for hauling up climbs with walk-off descents. Weight: 1 lb. 14.4 oz. What we like: A comfortable, inexpensive, and lightweight all-rounder. What we don’t: Not our favorite outsole design. The Crux is Scarpa’s most popular all-around approach shoe, and a recent update offers a modernized look and increased grip with a new rubber compound. This shoe is capable enough to handle anything from heinous side-hill slogs under a heavy load to moderate climbs such as the classic Wolf’s Head in the Wind River Range. We prefer it over La Sportiva’s equally popular Boulder X below, which feels clunky by comparison. And because the suede upper stretches a lot less than the Boulder X—thanks in large part to the Kevlar webbing that connects the laces to the midfoot—the Crux has a more consistent and secure fit. Weight: 1 lb. 5.2 oz. What we like: Comfy liner and lightweight build. What we don’t: One of the pricier shoes on the list. Leave it to Arc’teryx to create an approach shoe that looks vastly different from most others on the market. The minimalist design of the Acrux SL features a seamless one-piece upper that’s impressively durable and water resistant. On the inside, the flexible, tongue-less liner gives the shoe a snug fit, keeping out debris and limiting the chances of developing hot spots. 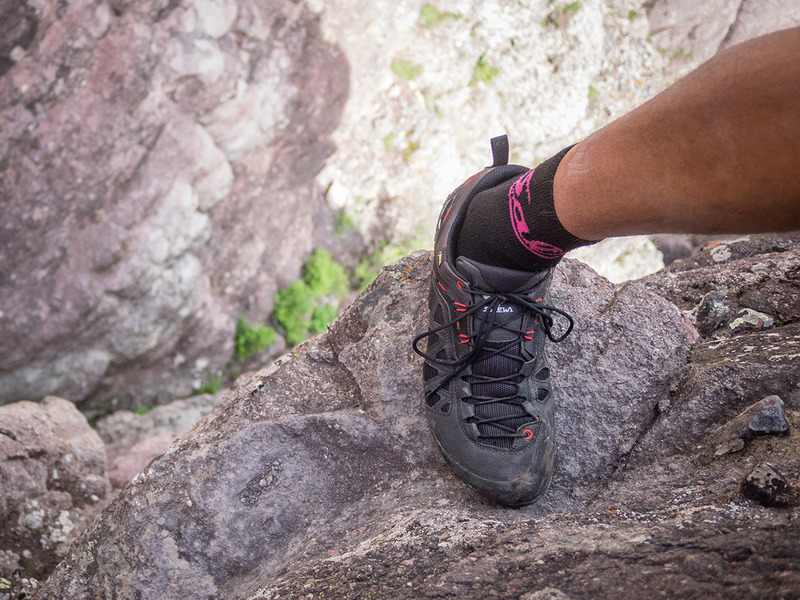 At 10.6 ounces per shoe, the Acrux SL is ideal for technical rock approaches and carrying up and over a climb. What we like: Sticky rubber and a great price. For climbers that are just starting out, or old hands looking for a value option, look no further than the La Sportiva Boulder X. This shoe is extremely comfortable, excels on the trail, climbs third and fourth class well, and boasts insanely sticky rubber. And don’t be fooled by the price tag—these shoes can often be found online for as little as $80. What are the downsides of the Boulder X? The shoe is too heavy to carry on a harness, doesn’t edge well on fifth-class terrain, and the bulky soles don’t take aluminum crampons well. Moreover, the leather upper stretches so much when wet that we’ve had issues with our feet twisting in the toe box, resulting in a tear where the rubber rand meets leather. That said, if you have wide feet and want an entry-level shoe that is a beast on the trail, the Boulder X should be near the top of your list. What we like: An amazing climber that actually hikes very well. What we don’t: Durability is sacrificed to make such a streamlined, technical shoe. 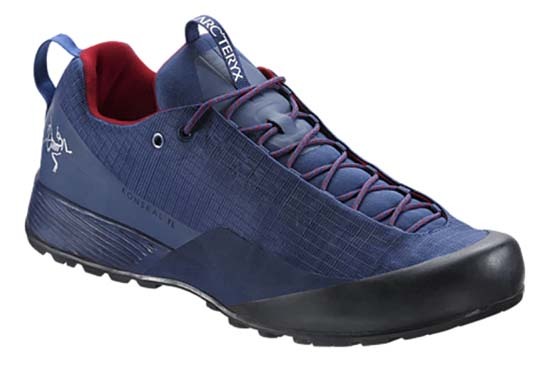 Scarpa’s goal with the Gecko was to make a slimmed-down, high-performance approach shoe that hits the middle ground between lightweight climber and rugged hiker. Overall, we think they did a pretty good job: the toe box is designed with climbing in mind, you get over-the-toe rubber for jamming in cracks, and even the sole is aggressive for smearing and technical edging. Additionally, a cushioned EVA midsole makes the Gecko relatively comfortable on the trail as long as your load isn’t too heavy. At $160, the Gecko is relatively expensive, and we’re not sure it’s worth the hefty price tag. It falls in the same weight category as the La Sportiva TX4, our top pick, but swings to the other end of the spectrum performance-wise. It’s deft on steep rock but too rigid, narrow, and flat for long days on the trail. Overall, unless climbing performance is your primary concern, we think the TX4 is a more versatile option. If you’re looking for more cushioning and support, see the Scarpa Crux above. Weight: 2 lbs. 0.4 oz. What we like: Big-time support and protection at a reasonable weight. What we don’t: Most of the time, a low-top approach shoe will suffice. The La Sportiva TX4 Mid GTX is our shoe of choice for terrain where you might want a mountaineering boot but aren’t wiling to carry the weight. Perhaps you’re climbing a route like the Brenner-Moschioni on Guillaumet in Patagonia, which requires hauling a heavy load miles to basecamp, kicking steps in steep snow on the approach, toting your shoes up the rock climb, and rappelling steep snow couloirs on the descent. A mountaineering boot would be ideal for the job, but thanks to the TX4 Mid GTX, you can have similar performance in a lighter package (lighter, in fact, than many low-top models). How does the TX4 Mid compare with the low-top version above? To start, the Mid comes with a Gore-Tex insert, which makes it the preferred option for snow travel, although the non-waterproof shoe breathes a bit better and dries out faster. Further, the boot model sits comfortably over the ankles for a boost in protection and stability over challenging terrain. Both are plenty tough for most backcountry uses, but if you prefer a high-cut fit for hauling seriously heavy loads into the mountains, check out the burly TX5 Mid GTX. What we like: Great for hiking and scrambling. What we don’t: Climbing performance is limited. Many shoes on the list are specialists: they hike well or scramble well, and are either tough or breathable, but rarely both. However, the Vasque Grand Traverse is one of the best all-rounders here, and particularly for those don’t intend to do much serious climbing in them. 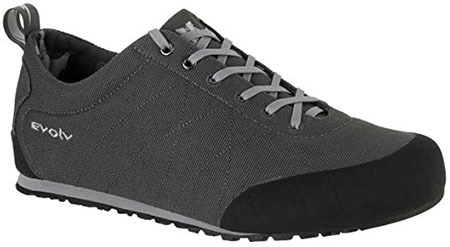 The design is reminiscent of a lightweight hiking shoe but with a burly rubber toe cap and sticky traction that holds impressively well on rock. And with a combination of leather and mesh on the upper, the shoe is both decently durable and breathable in warm weather. What we like: One of the best hikers in our lineup. What we don’t: Mediocre edging and smearing abilities. 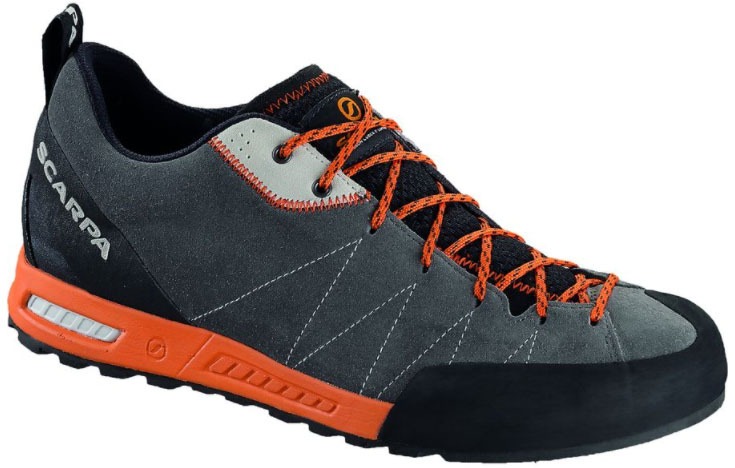 When I think of climbing in Washington’s Enchantments, I think of the Scarpa Zen Pro. In this range, you might be hiking 10 miles to the base of a climb, then swapping your approach shoes for climbing shoes to tackle 5.10 routes up pristine granite peaks. For such an approach, you don’t need a shoe that climbs well, but it certainly needs to be able to handle long and technical trails and a bit of third class scrambling. Scarpa’s Zen Pro is just that, a shoe made with attention to durability, support, and comfort on the trail. A more robust version of Scarpa’s classic Zen, the Zen Pro is made to take a beating and last, with beefy suede uppers, a large rubber rand, and PU-injected reinforcements along the base for added abrasion resistance. Furthermore, its midsole is designed to provide the height of hiking support. All of these features do come at a cost—at 2 pounds 2 ounces, the Zen Pro is one of the heaviest shoes on our list, and is not sensitive or streamlined enough to climb technical rock well. 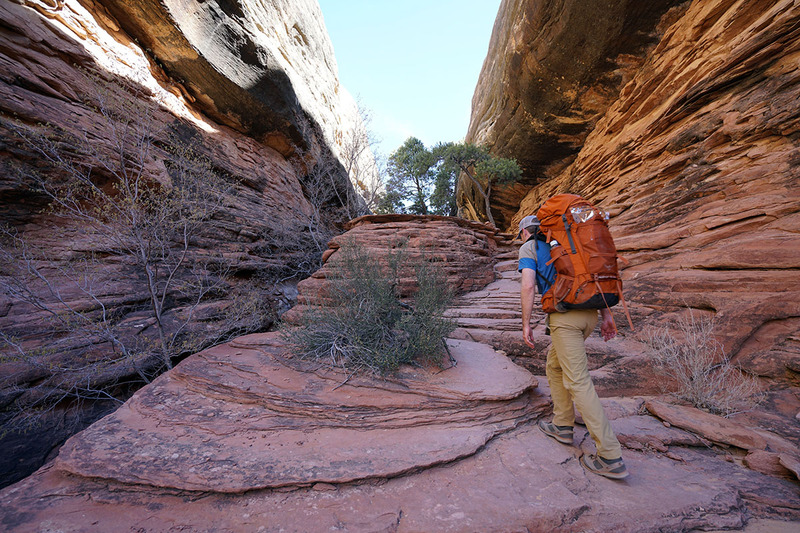 We don’t recommend it for carrying on your harness up and over a climb either, but when you just need a solid, durable hiker with exceptional traction on rock, the Zen Pro is an excellent choice. And a huge bonus: it now comes in a women's version too. What we like: A unique trail runner/approach shoe hybrid. What we don’t: Cushioning detracts from stability and sensitivity. The unique Arc’teryx Konseal FL is a hybrid climbing/running shoe that appeals to the fast-and-light crowd. It combines the support and traction of an approach shoe with the agility and spring of a trail runner, making it an excellent choice for quick alpine scrambling. 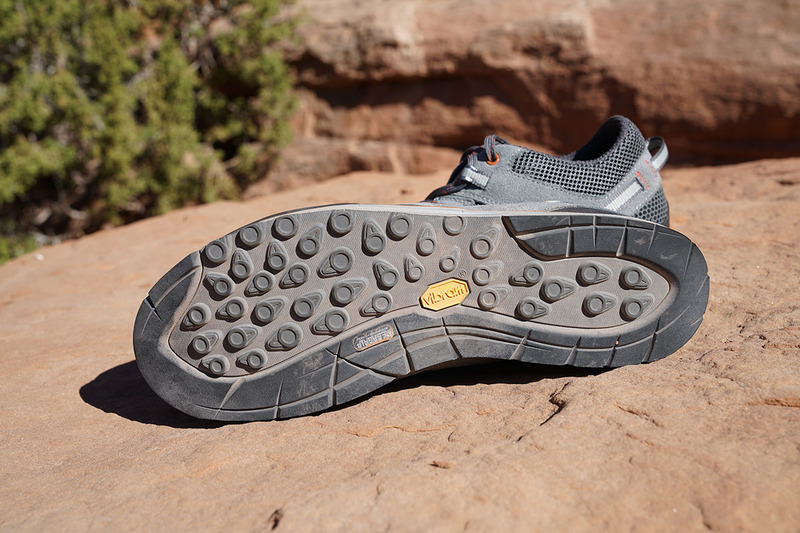 The Vibram Megagrip sole is similar to that of the discontinued Acrux FL, and a toe cap extends over the front for protection while moving over rock. But with a springy foam heel, mesh upper, and low 10.5-ounce weight, the Konseal is nimbler and more confidence inspiring than the old Acrux FL for running. What does the Konseal FL give up with its hybrid design? With a trail runner dose of cushioning, you’ll gain some bounce and save weight, but sacrifice some of the stability and sensitivity of a full-blown approach shoe. For a similar best-of-both-worlds design that falls more on the approach shoe end of the spectrum, try out the La Sportiva TX2. And like the Acrux SL above, don’t expect the Konseal’s sole to inspire confidence on wet terrain. What we like: Sticky rubber; durable for such a lightweight build. What we don’t: Not good for crack climbing. 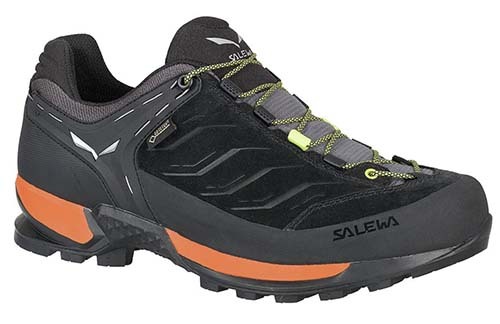 Salewa’s Firetail 3 GTX approach shoe is a modern and nimble alternative to the burly Mountain Trainer above. Weighing 1 pound 12 ounces for the pair, the Firetail is a whopping 10 ounces lighter than the Mountain Trainer and doesn’t give up a whole lot in terms of trail comfort, durability, or waterproofing. 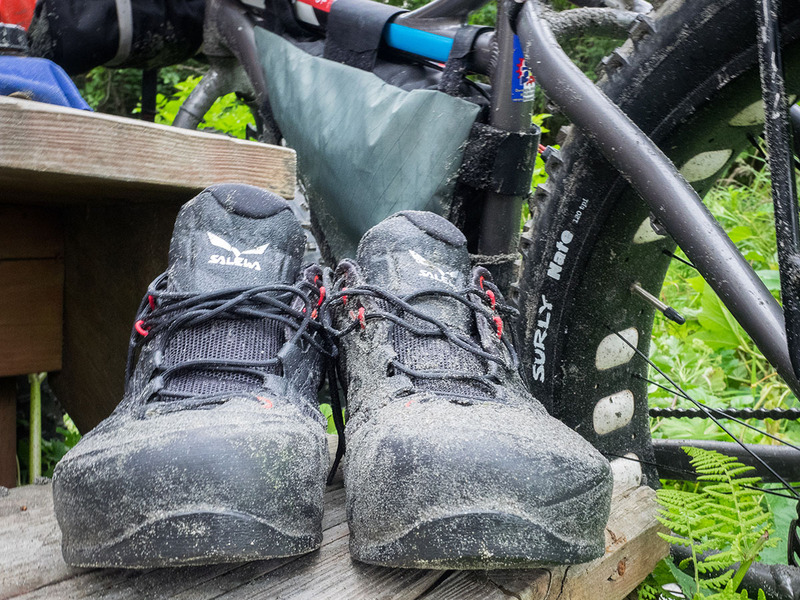 Traction is excellent even in the wet—we really put the Firetail to the test on a trip in southeast Alaska—and the mesh upper breathes well without compromising on tear resistance. Weight: 1 lb. 9.8 oz. 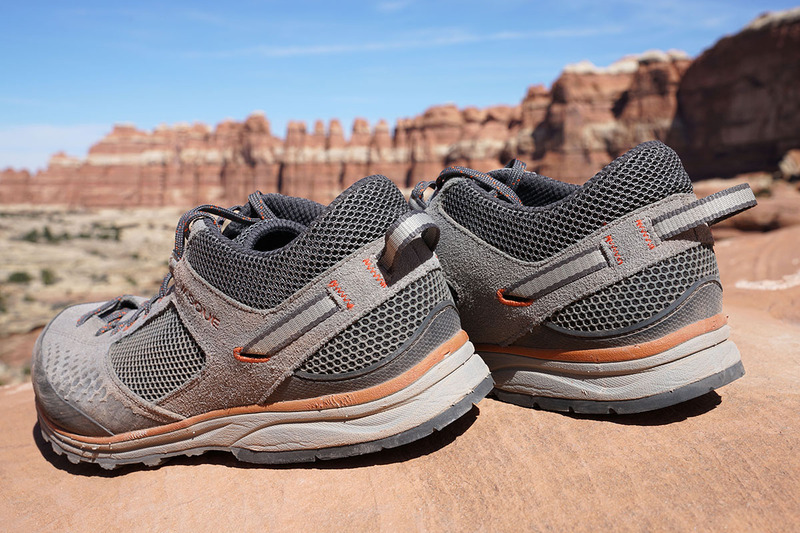 What we like: Good looking shoe; comfortable and supportive on the trail. What we don’t: Not designed for climbing. 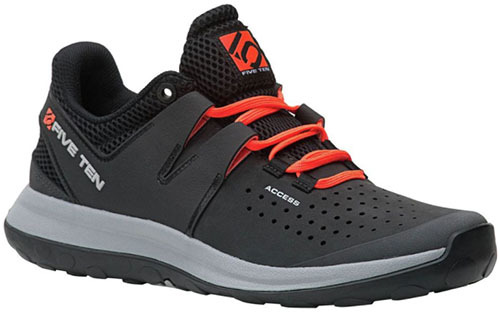 Five Ten’s Access shoe is true to its name. With high levels of comfort, support, and protection, this model is in its element when accessing rock—but its performance stops there. Discerning eyes will know at first glance: lacking a clip-in loop, featuring a conspicuously small rand, and with lacing that does not extend to the toe, the Access simply is not made for climbing (we recommend a shoe like Five Ten’s Guide Tennie instead). To continue the comparison with the Guide Tennie, the Access is dramatically more flexible, and the S1 sole is far less performance oriented than C4 rubber. 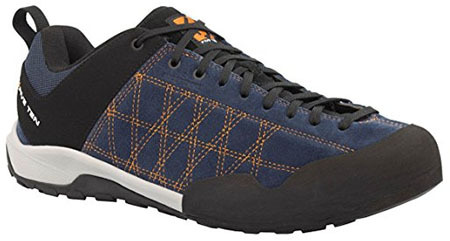 The Access has an athletic style and is more at home at the sport crag, in the boulders, or on the way to the gym than clunkers like the La Sportiva Boulder X or Scarpa Zen Pro. For a slight price drop, the Access comes in mesh and knit versions as well, which are better for light, summertime approaches or the occasional trail run when extra grip is helpful. No matter the material, the Access is outdoor chic, doubling as an around-town shoe better than most. Of note: this shoe has a “technical” fit and Five Ten recommends sizing up a half size. What we like: All the best features of a crag shoe. What we don’t: Expensive, not versatile. For a day at the boulders or while grabbing a beer afterwards with friends, the Arakys are Arc’teryx’s version of the Evolv Cruzer Psyche. They easily transition on and off, have a one-hand buckle closure, are barefoot friendly, and sport a collapsible heel, making the shoe a comfortable belay slip-on. 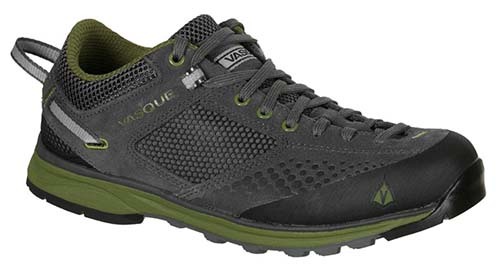 These shoes are also perfect for an area like Squamish, where approaches are minimal and most long routes require shoes for a walk-off descent. Additionally, thanks to their close-fitting slipper build, the Arakys actually climb pretty darn well. The Arakys certainly have enough technical components to fill the page (this is Arc’teryx we’re talking about, after all), like a Vibram Megagrip sole and similar liner and shell found in the Acrux above. For a crag shoe, it’s even a little overkill. We would not recommend these shoes for long, technical approaches with a heavy pack, but the Arakys are just as durable as they are lightweight (don’t expect them to blow out as quickly as the lightweight Evolv Cruzer Psyche). This is great news—especially considering they’re double the price. What we like: Supportive hiking boot that can hold its own on rock. What we don’t: Heavy, lacks the climbing prowess of an approach shoe. 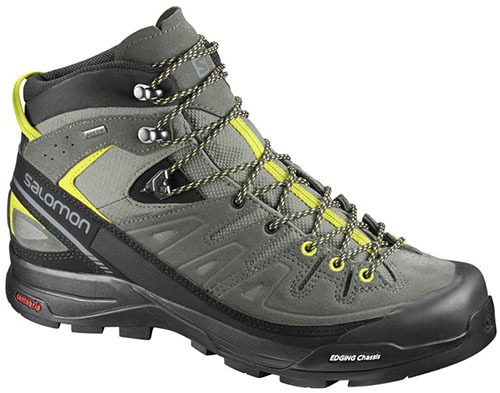 Salomon tops many of our footwear “best of” lists, so it might come as a surprise that they barely make the cut here. The multi-sport company does not make a traditional approach shoe, but we do think their Gore-Tex lined Alp Mid is competitive with mid-height options like the La Sportiva TX4 above. What appeals to us most about the Alp Mid, especially with respect to climbing, is the shoe’s sturdy platform. The laterally stiff midsole offers a secure edging base and Contragrip rubber provides a solid dose of traction on rock and trail. The Alp Mid does not have an approach shoe sole, but it’s close. What pushes the Alp Mid to the bottom of our list? 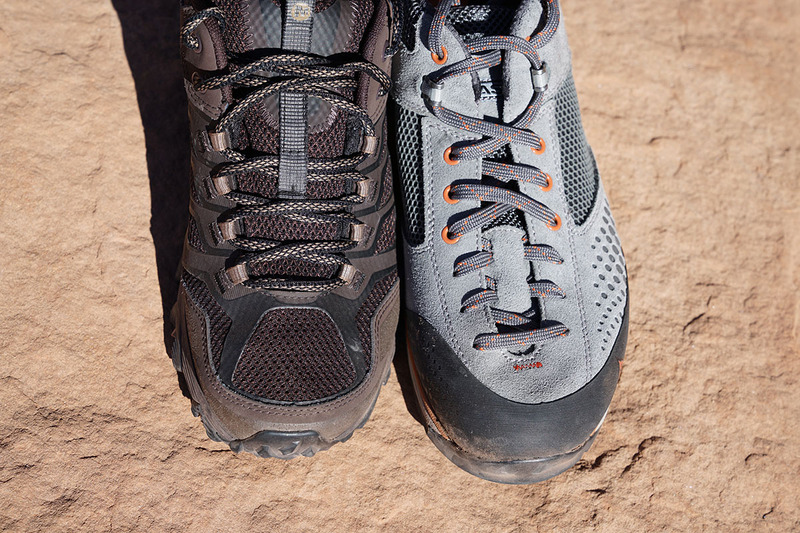 In sum, it’s simply more of a hiking boot than an approach shoe. It’s too heavy, bulky, and burly for fast-moving mountain objectives, and the Gore-Tex lining is overkill for most summer climbing trips. But we mention it here as a high quality, comfortable option for hikers looking for a rock-ready boot (perfect for a granite-covered hike like the John Muir trail). And for climbing in regions like Alaska or Patagonia—where a route might contain equal parts snow, ice, and rock—the Alp Mid could be a perfect middle-ground option. We’ve come back to this concept time after time throughout these reviews, and yet here it is again, distilled. Approach shoes are a combination of a climbing slipper and a hiking boot, made to both climb well and hike well. However, with the great variety of shoes to choose from, there are some that hike better than they climb, and some that climb better than they hike. Approach shoes that excel on the trail generally have a larger profile, roomier fit, and added cushioning for long days on your feet. They’re supportive and protective under heavy loads, and hold traction well on both established and cross-country terrain—even on snow. Once on technical rock, however, they often become clunky and insensitive. On the other side of the spectrum, shoes that climb better than they hike are a bit lighter weight and stiffer, with edges and toe box rubber that make for delicate connection with rock. These shoes often are sized snugly, providing more sensitivity and precision (for more on this, see the section on fit and sizing below). When buying an approach shoe, make sure you consider your intended use. For example, if you’re hiking long distances over snow and rock, you will want a different shoe than if you commute five minutes to the crag and need to be able to slip your shoes on and off all day. Below we break down this usage into a number of helpful categories. Approach trails have a reputation for being rather steep, unmaintained, and technical. You might encounter wet terrain, scree, or need to navigate boulder fields, all with a load on your back. If your approaches are on the longer side, or you’re venturing into the mountains for days on end, we recommend a highly durable shoe that is built to protect your feet and provide support for the long haul. Approach shoes in this category include the Scarpa Zen Pro, Salewa Firetail 3, and La Sportiva TX4. Some climbers are adamant that their approach shoes climb well, whether they’re guiding clients day after day up mid fifth-class routes or linking up moderate climbs and ridgelines in the alpine. The shoe of choice for this sort of use will provide enough support and protection on the trail while being snug and low profile enough to climb well on steep rock. Approach shoes in this category include the Five Ten Guide Tennie, Scarpa Gecko, and La Sportiva TX3. When climbing in areas with short approaches and descents off the backside—think Squamish and Tuolumne—it’s helpful to have a shoe that is small and light enough to hang off your harness during the climb, but also one that can get you down safely on the deproach. If you’re skilled enough, a pair of flip-flops might do. However, for more protection and traction and just slightly more ounces, a lightweight approach shoe is the solution. Approach shoes in this category include the Evolv Cruzer Psyche and Arc’teryx Arakys. If you’re headed to an alpine climbing area such as the Bugaboos or North Cascades, you’ll want a shoe that can handle snow as well as rock. Additionally, you’ll want your shoe to be able to handle a pair of lightweight crampons for firmer snow. Soles like that on the Five Ten Guide Tennie are decidedly not made for snow, but many soles are. Also consider a higher-profile, sturdy design that can kick steps in snow effortlessly. Mid-height boots are great for snowy conditions as well. 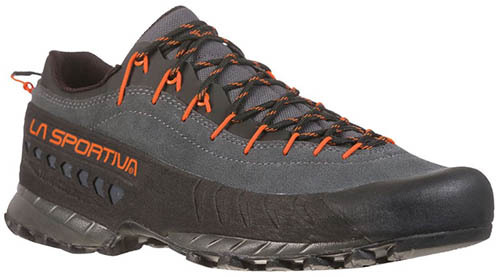 Approach shoes in this category include the La Sportiva TX4 Mid and Salewa Mountain Trainer. If you’re a sport climber or a boulderer, or a trad climber who simply crags, consider whether or not you need an approach shoe. 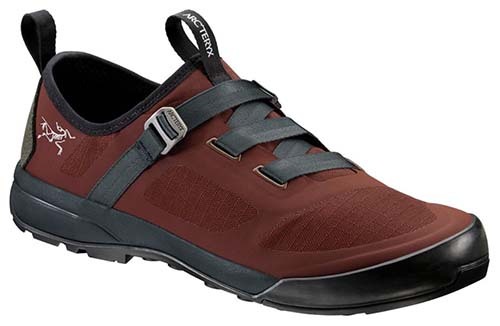 That said, there are several companies that make approach shoes specifically for cragging, with easy on/off and heels that fold down for a quick slipper. Additionally, craggers might consider shoes that would serve other purposes, such as a hiking shoe or a trail runner. 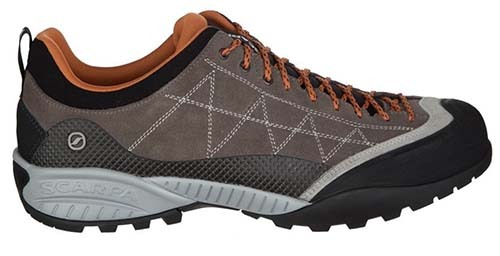 Approach shoes in this category include the Evolv Cruzer Psyche, and Arc’teryx Arakys. Approach shoes are specifically designed for climbers as a replacement to the hiking boot, so what’s with the mid-height approach shoe? Climbers may opt for a mid-height model for a variety of reasons. Perhaps you need more ankle stability or protection, whether you’re carrying heavy loads over tricky terrain or preventing ankle rolls. 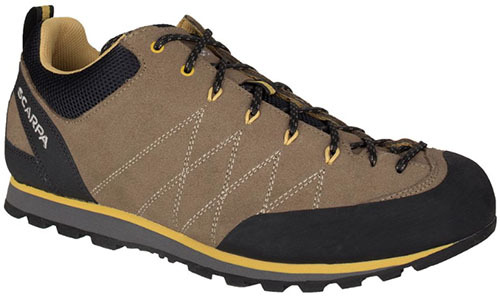 Perhaps you want a lightweight hiking boot but crave the sticky rubber of an approach shoe. Perhaps you plan on traveling over snow a great deal and want to keep snow out of your boot while having a sturdy attachment point for a pair of crampons. Or, perhaps you’re a big wall climber who needs more support when standing in aiders for days on end. The mid-height approach shoe can be used to level up—both weight-wise and stability-wise—from a typical approach shoe, or level down from a hiking boot. For example, when the hiking is technical and weight is less of an issue (i.e. you’re not planning on carrying your boots on a climb), the mid-height shoe is an excellent choice. 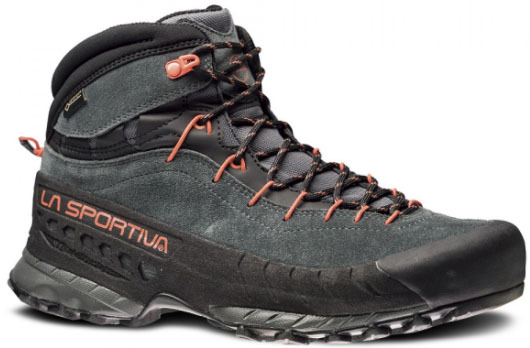 Approach shoes in this category include the La Sportiva TX4 Mid and Salomon X Alp Mid. The sole of an approach shoe can tell you a lot about what it’s designed for. There are three main areas to an approach shoe sole: the toe box, the midfoot, and the heel brake area. Starting with the toe box, most approach shoes have a large rubber rand that surrounds the front, sides, and top of the toes, mimicking a climbing shoe. And approach shoes that are made to edge and smear well will have a smooth patch on the sole underneath the toe, allowing for close and responsive contact with the rock. Moving to the midfoot and heel brake, the outsole design here can vary quite a bit between models. 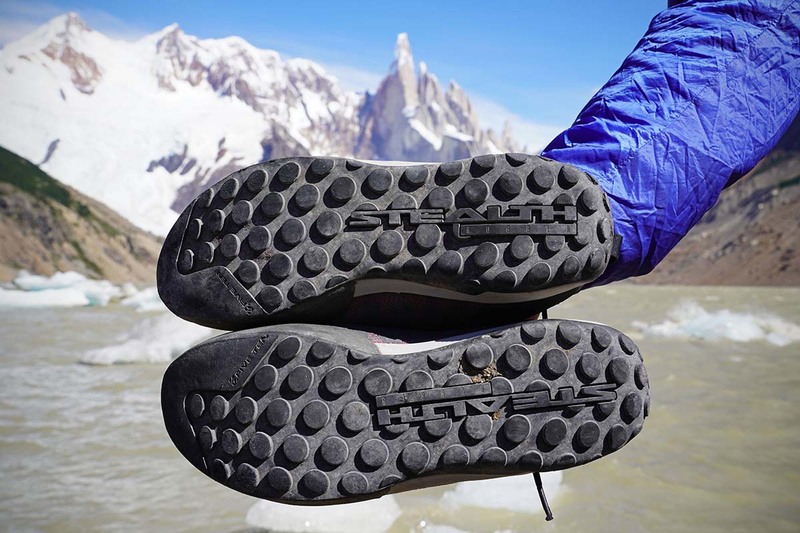 Generally, the dotty style found on shoes such as the Five Ten Guide Tennie or the Arc’teryx Acrux provides great surface area on rock, but fails to perform on wet or snowy terrain. 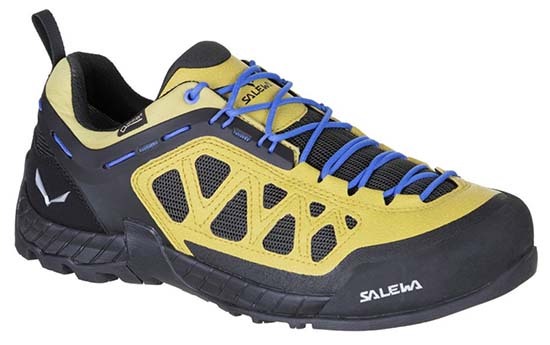 On the other hand, models with more sharp tread on the midfoot, like the Salewa Mountain Trainer, are made to provide a high amount of traction on wet and snowy terrain, but are generally more clunky on technical rock. Lastly, most approach shoes will have a heel brake, made of thin strips of sticky rubber for traction and downhill braking. Some shoes lack a heel brake, some lack a technical patch on the toe, and all will have slight variations in the midfoot rubber. Pay attention to each of these features to make sure you purchase an approach shoe that meets your specific needs. For the majority of users that wear their approach shoes exclusively for hiking and moderate scrambling, edging is a non-issue. But for those who are proficient enough to climb technical terrain in the same shoes they hike in, a stable edging platform is essential. Most shoes in this category have a flat rubber patch under the big toe, providing a smooth and responsive platform for edging. Not only that, but climbers will want to look for models where the rubber rand comes flush to the sole (as seen in the Five Ten Guide Tennie and the Scarpa Gecko). This provides a seamless, stiff edge like that of a climbing shoe. Even to the uninformed eye, this edge will look different from one that is made up of layers of cushioning, like that of La Sportiva’s Boulder X. 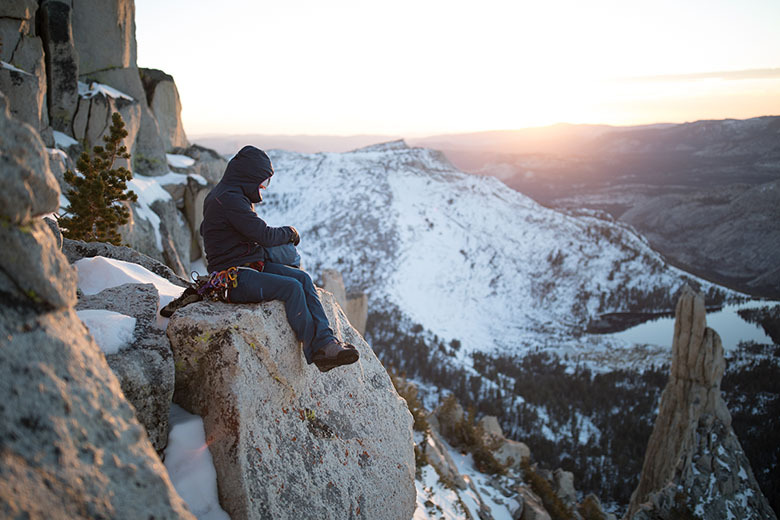 With a few exceptions, climbers generally limit their endeavors to days when conditions are dry and warm. In the world of approach shoes, breathability is a far more important factor than waterproofing. However, waterproofing is a nice security blanket if your climbing takes you into the mountains. The extra protection that comes with a waterproof and breathable membrane inserted into the shoe is great for creek crossings, surprise rainfall, or crossing snow. However, the extra layer adds weight and impacts breathability pretty significantly, hence why there are very few Gore-Tex models on our list. 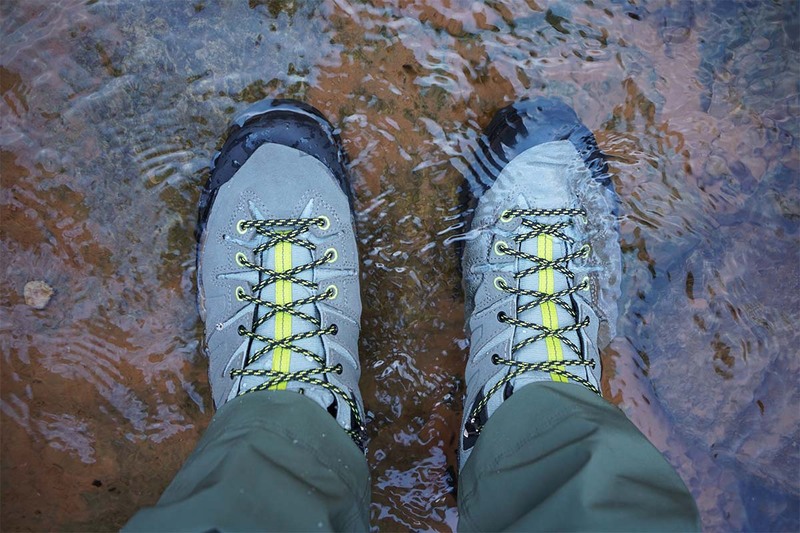 If you know you’re looking for a waterproof approach shoe, however, we’ve found GTX models to work consistently well, including the Salewa Firetail 3 GTX, La Sportiva TX4 Mid GTX, and Salewa Mountain Trainer GTX. In terms of breathability, approach shoes constructed with a mesh upper are going to breathe better than the suede or leather versions, and far better than the GTX models. Canvas shoes such as the Evolv Cruzer fall somewhere in the middle of the breathability spectrum. There certainly is a tradeoff, however: highly breathable shoes like the La Sportiva TX2 are not as durable or protective as their leather counterparts (the La Sportiva Boulder X, for example), and will shred in cracks much quicker. The La Sportiva TX3 offers a unique combination: a mesh upper surrounded by a protective rubber rand. Additionally, shoes with a mesh upper are far more permeable to small debris such as sand, dirt, and snow. If breathability is your main concern when choosing an approach shoe, go with a mesh model. However, if you want to preserve the features that make an approach shoe what it is—a level of stiffness, protectiveness, and durability—opt for a shoe with a leather, suede, or canvas upper. The weight of an approach shoe matters both when it’s on your foot and when it’s in your backpack or hanging on your harness. Hiking mile after mile with less than a pound on each foot is going to feel far less strenuous than if you had a two-pound boot on each foot, and the same goes for carrying the shoes. Consider the weight of an approach shoe especially if you’re spending just as much time carrying them as wearing them on your feet. Most likely, the more this ratio tends towards carrying over hiking, the lighter a shoe you should consider (the Evolv Cruzer Psyche, for example). However, there are always trade-offs in shaving weight. The lighter your approach shoe, the less protection, stability, and durability it likely offers. If your approaches require a high amount of performance from your shoes, don’t streamline too much. There always is a compromise when choosing the size of your approach shoe. Some prefer to size their shoes to fit snugly so that they are responsive and stable on technical rock. Some prefer to size their approach shoes more like a hiking shoe, with a bit of room for the toes to move around for downhill slogs and over long distances as the feet swell. Most approach shoes are constructed with a to-the-toe lacing system, so it is possible to provide your toes with more or less room depending on the activity. Because of this, we recommend sizing your shoe comfortably with the ability to cinch the laces down tightly. Additionally, make sure you buy a model that fits the width of your foot well. Different brands or models fit differently. For example, La Sportiva's TX shoes are known to be rather wide, whereas the Scarpa Gecko has a snug fit. Most approach shoes have built-in shanks or internal supports to provide a degree of stiffness. This construction differentiates these shoes from light trail runners, though they are a far cry from the full shank of a mountaineering boot. In general, the more technical your terrain, such as snow, scree, or steep trail, the more you will benefit from a stiffer approach shoe (examples include the Salewa Mountain Trainer or Scarpa Zen Pro). A stiff shoe might be less comfortable in the short term, but over the long term it will keep your foot from flexing and straining to support itself. All of the shoes on our list, even the lightweight Evolv Cruzer Psyche, have a rand that extends over the toe box, providing protection from stubbed toes and additional traction on rock. Many of these shoes have full, wrap-around rands, providing this level of protection and traction around the entire foot. 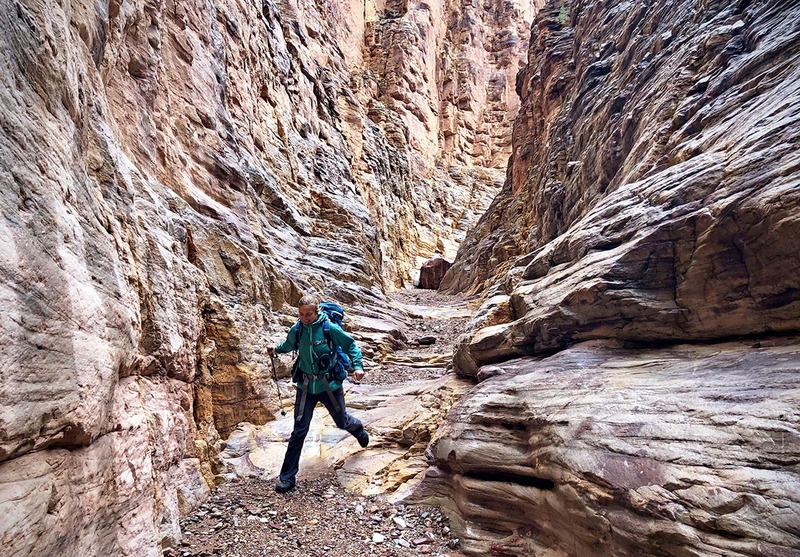 The larger the rand—both in height and in area covered around the foot—the more durable the shoe and the better it will perform in cracks and on rocky trails. However, more rand also contributes to more weight and less breathability. The type of material used in a shoe’s upper—the fabric that connects to the rubber outsole—correlates directly with its durability, water resistance, and breathability. Most often, a shoe will be made with synthetic (typically nylon) mesh, leather, or a mix. Below we spell out the pros and cons for the most common materials used for approach shoes. Mesh woven nylon as well as open mesh nylon panels are becoming increasingly common in approach shoe construction as manufacturers seek to shave weight from their models. This type of upper certainly aids in breathability and cutting weight but detracts from the waterproofing, durability, protection, and climbability of the shoe. The majority of approach shoes, similar to climbing shoes, are made with a leather upper. Without getting too deep into technicalities, suede, leather, and Nubuck are all derived from the same material and generally perform similarly. On approach shoes, this leather will be lighter and more flexible than the typical glossy full leather you might see on an old hiking boot. Of all upper materials, leather will provide the most protection, durability, and water resistance. However, it’s the least breathable. Occasionally, as in the case of the Scarpa Gecko or the Vasque Grand Traverse, leather and mesh will coexist to provide both breathability and durability. Leather also tends to stretch. Because approach shoes aren’t sized as tightly as climbing shoes, approach shoes will not stretch as noticeably. However, especially when wet, full leather models such as the La Sportiva Boulder X certainly will expand, leading to a less supportive fit. On the flipside, as these all-leather models dry, they will conform more to the size of your foot (if they dry while on your foot), and fit even better. One shoe included on our list is made of canvas: the unique Evolv Cruzer Psyche. Canvas is far less durable and water resistant than leather, but provides a high level of breathability. Further, it is great for summer environments where you’re not putting your shoe through the wringer. Approach shoes aren’t cheap, and much can be done after purchase to ensure their longevity and performance. Below, we offer three suggestions for shoe care. Your shoes are getting you through some tough environments, and mud, bits of sand or dirt, and wet terrain can all add up. At the end of a day out, feel free to give the shoes a spray down with the hose if need be, leaving them out to dry completely. Turn your shoes on their sides and stuff them with newspaper to speed up drying. Additionally, throughout the day or at the day’s end, take out the insole and give your shoes a good shake—all that sand and dirt can accumulate and abrade the material quickly if not taken care of. If you have approach shoes with a leather upper, it is wise to treat them with a leather conditioning/waterproofing product. If not treated, leather can absorb water, making it heavy and more prone to stretch and shrink. Nikwax and Gear Aid both have a full line-up of products that will do the trick. 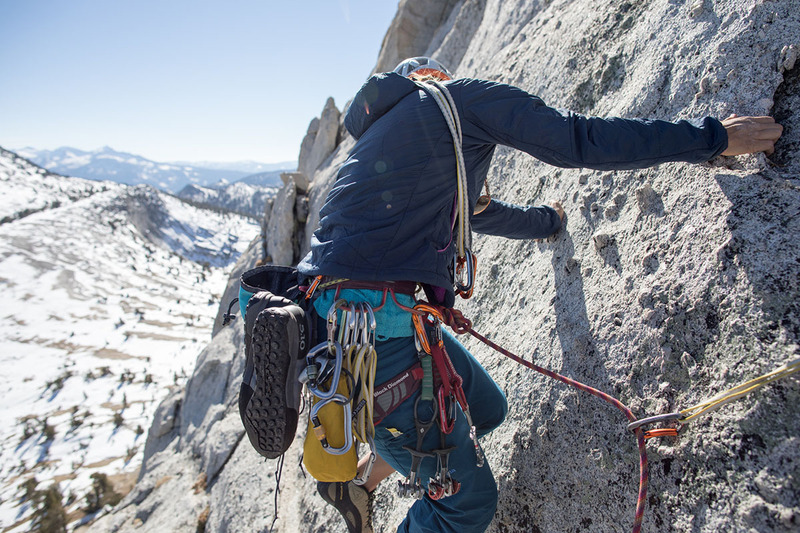 Climbers often apply seam grip to the seams of their climbing shoes (where the rand meets the leather and the stitches in the leather) to reinforce them against abrasion from cracks. This simple practice drastically increases the lifespan of a pair of climbing shoes. You can perform the same practice with approach shoes, especially if planning on using the shoes for technical climbing and jamming. Additionally, if you’re using your shoes for big wall aid climbing, the toes will blow out extremely quickly if not reinforced. Gear Aid products such as Seam Grip or Freesole can be applied to these wear-and-tear areas upon purchase and many times thereafter. The outdoor world is full of gear, and there’s always something else to acquire. But let me ask you this: Can you hike up a hill with your current pair of trail runners or hiking shoes? Heck, can’t you hike up a hill in your flip flops? 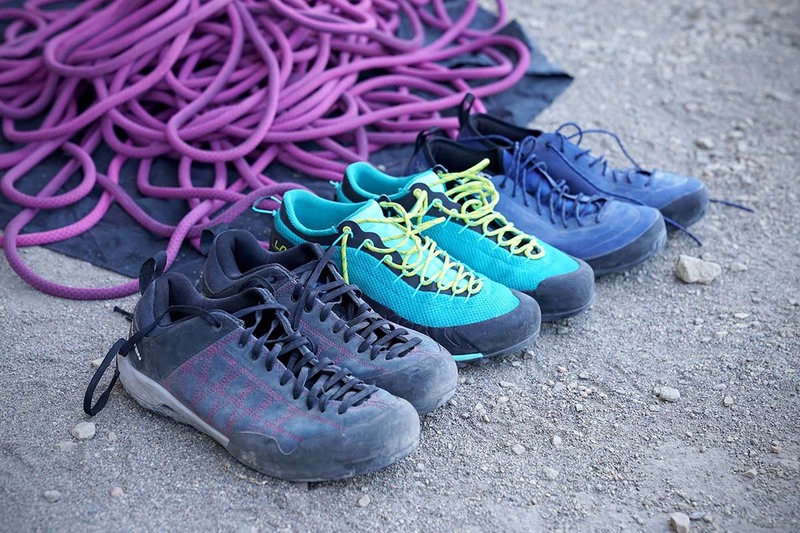 The vast majority of climbers spend most of their time cragging or bouldering, and generally, any moderately technical shoe (or a skilled user of a not-so-technical shoe) will do the trick. Approach shoes absolutely have their time and place, and we appreciate the extra protection around the foot, but be sure to question yourself before you start thinking that you need a pair.